Using Acronis’ award-winning disk imaging technology, Acronis Snap Deploy creates an exact disk image of a standard configuration you choose, including the Operating System, configuration files and all applications. It then deploys that image to multiple systems simultaneously, making it ideal for rapid bare-metal installations onto servers and PCs. From a central administration point, you can deploy a master image – including Operating System and applications – to multiple PCs or servers across your network simultaneously, via multicast or unicast. It’s fast and easy. Deploy on your own terms! 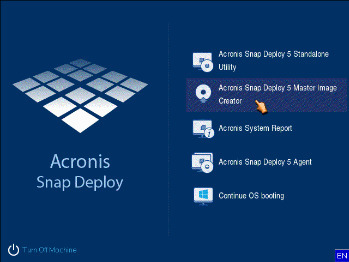 Acronis Snap Deploy gives you plenty of options, including manual, automatic, user-initiated and scheduled deployment. Additionally, Wake-on-LAN automatically boots powered-off machines. And standalone image deployment lets you deploy an image even if your network is down. If you need to deploy your image to PCs with different hardware architectures, no problem. The product ensures that your new systems boot up correctly even if they’re running on dissimilar hardware. As soon as you finish a deployment, Acronis Snap Deploy allows you to easily modify Windows settings, such as computer name, IP configuration or SID, in order to offer your end-users optimal customization and ensure unique names on your network. You can assign individual settings to each PC or server to ensure they all receive an appropriately tailored configuration. The new list of machines allows monitoring of progress and status, as well as pre-configuration of new machines identified by their MAC address. To be ready for deployment, you can boot your machines from customizable media such as CD, DVD, flash drive, or from Acronis PXE Server with network boot. Acronis Snap Deploy lets you choose between both Linux and WinPE bootable environments. And it allows you to add necessary drivers to WinPE media to ensure it works on your new hardware. For starters, this latest version boasts a newly enhanced user interface that simplifies installation and configuration. It supports new hardware too. You’ll also benefit from flexible new deployment options, like the ability to configure unique settings per machine.